Anthony Gaines takes a defender off the dribble. The sophomore guard played 35 minutes on Friday. In its past few games, Northwestern has had to find a way to make things happen without its leading scorer. Against Iowa on Jan. 9, when senior forward Vic Law shot 4-for-13 and 0-for-5 from deep, it was sophomore guard Anthony Gaines who stepped up, scoring 13 points and hitting all seven of his free throws, but it wasn’t enough for the Wildcats to get away with a win. Against No. 2 Michigan on Jan. 13, when Law sat out with a lower-body injury, senior center Dererk Pardon took a team-high 16 attempts and scored more than 20 points for the third time this season, but NU still lost by 20. For a moment during Friday night’s game against Rutgers, it looked as though this game would be a similar story. Law was back after the injury, but through the first half, he’d only scored two points and had two turnovers through the first half. The Cats were facing another test — they’d likely have to win this one without their leading scorer at his top form. Pardon scored 17 and graduate guard Ryan Taylor added 14 — his second-most in conference play this season — in a team-driven effort that gave NU (11-7, 2-5 Big Ten) the 65-57 win over the Scarlet Knights (8-9, 1-6) in Piscataway, N.J. on Friday. Six players scored more than five points for the Cats, a seemingly insignificant statistic but important in a game in which only nine NU players played and for a team that has yet to crack 70 points in the new year. In 35 minutes off the bench, Gaines didn’t finish with a flashy statline, but he tallied six rebounds and three blocks. 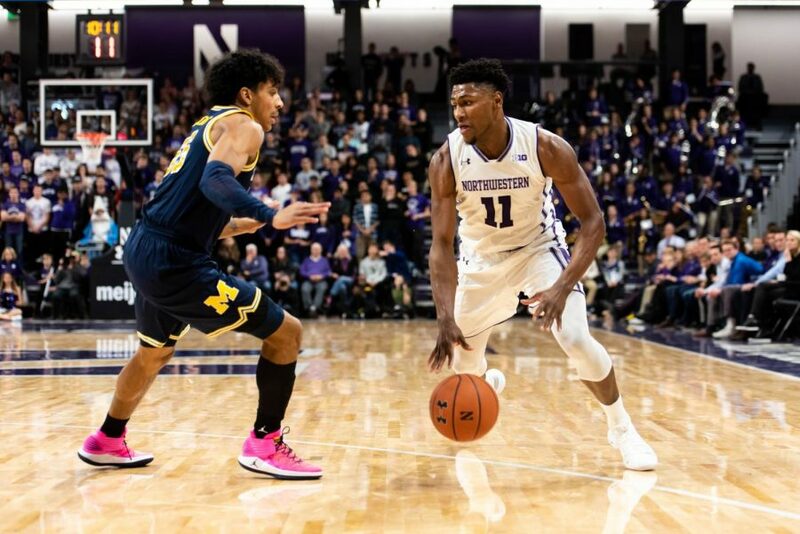 The sophomore banked a 3-pointer and slammed home a putback dunk for five of NU’s 18 points from field goal range in the second half, and continued to show promise as one of the most underrated younger players in the conference. Freshmen forwards Miller Kopp and Pete Nance combined for an additional 15 points, the most they’ve scored together since the Nov. 16 game against Binghamton. Collins said that Law — who finished with 6 points on 2-for-10 shooting from the field and 0-for-5 from beyond the arc — was rusty after going about 10 days without doing much of anything basketball-related. That said, the senior was still able to contribute with seven rebounds, five assists and a strong performance on the defensive end. It will be an even tougher test to take when All-Big Ten candidate Romeo Langford and No. 25 Indiana come to town on Tuesday, but Friday’s performance in New Jersey showed that this team can come together and produce, even without its leading scorer at full form.